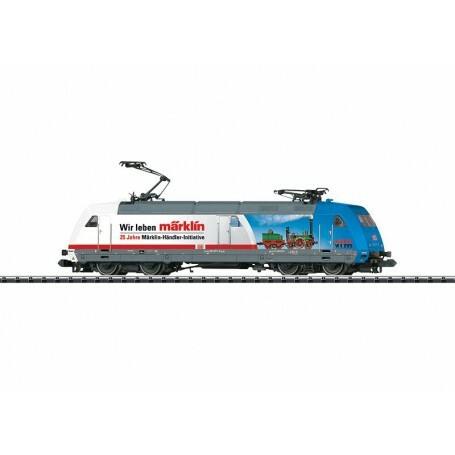  Ellok klass 101 071-9 typ DB "25 Years of the MHI"
Ellok klass 101 071-9 typ DB "25 Years of the MHI"
Denna produkt ger dig 2447 bonuspoäng. Ellok klass 101 071-9 typ DB '25 Years of the MHI', loket har digitaldekoder, ljudmodul, drivning på 4 axlar, slirskydd, längd över buffertar 119 mm, epok VI. Prototype: German Railroad, Inc. (DB AG) express locomotive, road number 101 071-9. With advertising decoration for the anniversary '25 Years of the MHI'. The locomotive looks as it did in 2015. Model: The locomotive frame and body are constructed of metal. The locomotive has a built-in digital decoder and sound generator for operation with DCC, Selectrix, and Selectrix 2. It also has a motor with a flywheel. 4 axles powered. Traction tires. Warm white LEDs are used for the headlights. They and the marker lights change over with the direction of travel. All of these lights and the locomotive's cab lighting can be controlled digitally. The locomotive has NEM coupler pockets. Length over the buffers 119 mm / 4-11/16'. Highlights: Metal body. Many sound and switching functions. Warm white LEDs for lighting.